Transformers News: Category - "Trans-Europe Express Group News"
Reports are coming in via former members of the Trans-Europe Express group that Masterpiece Grimlock has now been spotted on the shelves of Toys R Us stores in both Germany and Poland. The figure is the UK release with a sticker added to the box in the native language. Thanks to Palatinus for letting the Trans-Europe Express group know about the latest batch of Slovakian Transformers toy sightings. Thank to fellow Trans-Europe Express Group member Transformers Megaweb for letting the rest of the group members know about this latest batch of Transformers sightings from Spain. The original sightings were reported here. Thanks to Cyke for letting the Trans-Europe-Express group know that Primus, with Minicon's, is now avaliable in The Netherlands priced at &eruo;50.00. He (Primus) was released last week, the variant that comes with Classics Minicons, at only &eruo;50. Originally reported at BTFA. Thanks to Franco Villa for letting the Trans-Europe Express group know that the Optimus Prime / Megatron Transformers Classics two pack is now out in Italy priced at 23.50 euros. Thanks to Xaviu sending us, via the Trans-Europe Express group, a list of the latest batch of Spanish Transformers Releases. They were all sighted in Feb.
Max Guida aka TfItalia of Transformers Italia has found Transformers Classic Grimlock, Astrotrain, Mirage, Cliffjumper and Ramjet for sale in Italy, reports Franco Villa to the Trans-Europe Express group. Thanks to Nevermore for letting the other members of the Trans-Europe-Express know that Alternator Ravage II is now out in Germany. Ravage (Jaguar) is now out in Germany, but despite earlier rumors it's not supposed to be a special edition for "T-Day" but actually a mass retail release. Groundsplitter, the webmaster of NTFA, let the Trans-Europe Express group know, back on the 28th Feb, that the following Transformer Classic figures have been sighted in Sweden. Astrotrain, Ramjet, Cliffjumper, Jetfire, Grimlock and Mirage. The deluxes are priced at 149 SEK. This is potentially good news for the UK since, as we reported on the 28th Feb, Woolworths recently updated their website with a listing for Astrotrain, so hopefully Grimlock and Mirage are not too far behind. Thanks to Gregg Nell for letting the Trans-Europe Express Group know that that the following Transformers Classics toys have been released in South Africa. Thanks to Franco Villa for letting the Trans-Europe Express Group know that Alternator Ravage (Jaguar version) has now been released in Italy. He was spotted by Transformers Italia member Touga here. 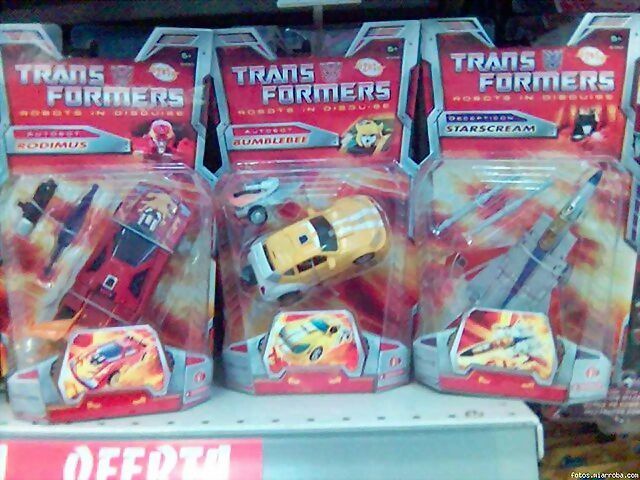 I spotted today Micromaster Ro-tor and Fireflight in my local shop. Price 19,90 PLN for each. Click the link or image above to view the Scattershot toy gallery. The gallery contains 5 images of this figure for your viewing pleasure. Page Rendering Time: 1.3296 seconds.